By remembering Arts 4 Dementia in your Will or by giving in memory of a loved one, you can help us provide access to stimulating arts opportunities for people affected by dementia. With your help, people living with dementia can live better for longer in the community. 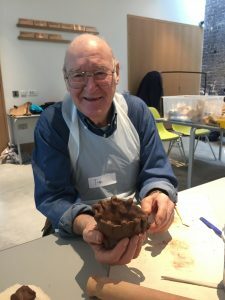 Creative engagement stimulates the brain and alleviates dementia symptoms, showing those who feel their lives are closing down that they can still develop new skills. 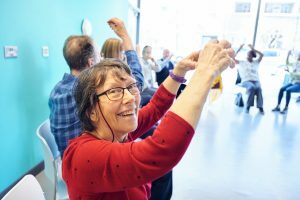 Our aim is to facilitate access to local inspiring and empowering arts workshops for people living with dementia and their carers, across the UK. A gift of just 1% makes a huge difference for us. 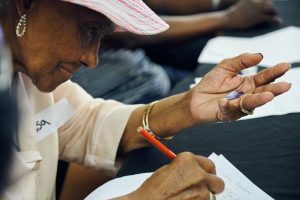 Your support enables us to work with arts and heritage organisations, giving training, advice and running exhilarating pilot workshop programmes, (such as Poetry at the Southbank Centre or Ballet at the Royal Opera House) to help them develop sustainable arts programmes for communities affected by dementia. I love watching J open up. It makes an enormous difference to my well-being – I’m not alone at home with doctors appointments. Remember a Charity provides comprehensive advice on making gifts to charities. Citizens Advice discusses why it is important to make a Will. GOV.UK provides advice on making sure your Will is legal. If you’d like to have an informal chat about leaving a gift to Arts 4 Dementia, please contact us. If you have already included Arts 4 Dementia in your Will, we would really appreciate you contacting us to let us know. A gift in memory of a loved one is a wonderful way to remember a life, whilst enabling us to reach out to more people affected by dementia in the community. You can create a special fund in their memory with a page on Virgin Money Giving, or request that friends and family make a gift instead of flowers at the funeral or memorial service. We would love to remember your friend or family member with a photograph and a note about their life on our In Memoriam page. You can make your donation through the Donate page on our website, or make cheques payable to Arts 4 Dementia. Please contact us if you’d like to have a chat about giving in memory. Leaving a legacy or giving In Memoriam makes a huge difference to us, and enables us to help more people affected by dementia through arts interventions. We are so grateful for your support. Visit the A4D Gallery to see the difference your gift makes.